Your registration will not be complete until payment is received! IMPORTANT: Please be sure to send, scan by email, or fax (617.627.3614) a copy of your latest physical/sports clearance form signed by your doctor (required) to the director, Cora Thompson (Cora.Thompson@tufts.edu), preferably prior to the start of the clinic you are attending. This form is required in order to participate. We accept Credit/Debit Cards, Checks, Money Orders, and Cash. Please make checks out to "Jumbo Volleyball Clinics, LLC". If you have any questions regarding payment, please contact us directly. If you choose to pay online using a credit or debit card, a small online convenience fee will be added to the payment. All registrations for both Spring and Summer clinics are done on a first-come, first-serve basis. All of our 2013, 2014, 2015, 2016, 2017 and 2018 clinics SOLD OUT, so be sure to reserve your spot early by submitting all the necessary paperwork (registration form, health information, waiver and full payment). For our SPRING/THURSDAY NIGHT evening clinic, the registration deadline is March 1st (or until the clinic sells out). To reserve your spot, submit all the necessary paperwork (registration form, health information, waiver and full payment). If you pay online, a confirmation e-mail regarding payment will be sent as soon as the payment is processed. A second confirmation e-mail will be sent when hard copy medical clearance forms are received. If you choose to mail in a check, a confirmation email will be sent when the payment is received. If you do not receive one, please let us know so that we can make sure your payment were received and processed accordingly. 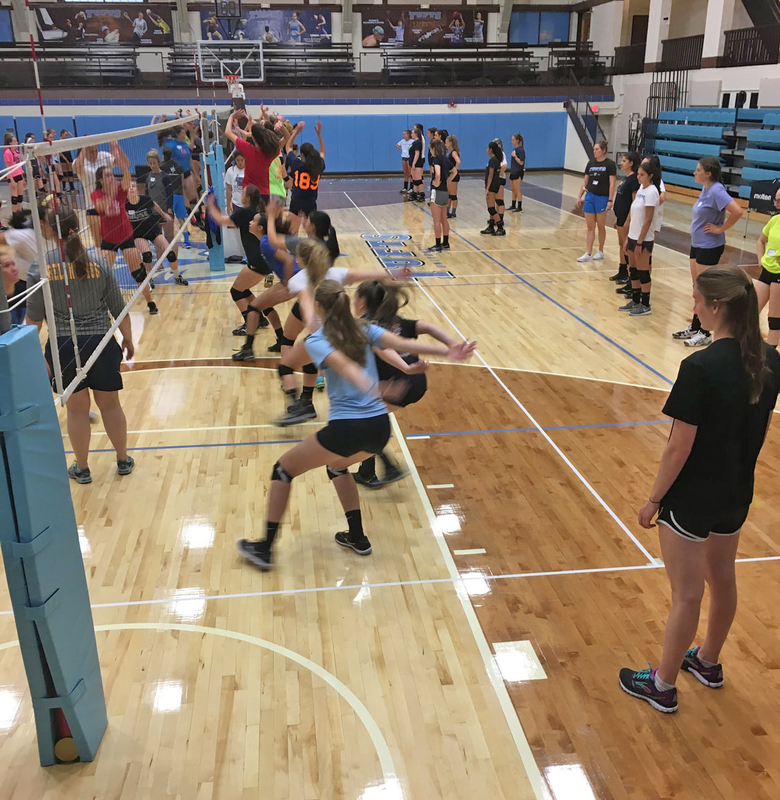 If a player needs to cancel for any reason, 14 days or less prior to the start of any summer JVBC clinic, 50% of their payment will be returned OR they can choose to receive credit for a future Jumbo Volleyball Summer Clinic good for one calendar year. We will deduct the cost of meals from any refund or camp credit during this 14-day period. We are required to pre-pay Tufts Dining services for all of our campers' meals in order for them to prepare adequately in advance of each clinic. This expense from Tufts Dining services is non-refundable to us if campers do not attend for any reason. If payment was done online, please understand that processing fees and credit card transactions fees are non-refundable as they can not be recouped by Jumbo Volleyball Clinics. For refunds requested directly to the credit card used, a 3% fee is charged for the transaction and will be deducted from the overall refund amount. If a participant has to miss any number of days due to injury, illness, etc., a camp credit will be issued towards a future summer clinic to be redeemed within one calendar year for a pro-rated portion of the cost of the clinic session missed. Due to the small nature of our clinics, this refund policy is strictly enforced. Thank you for understanding. Please note: SUMMER camp credits CANNOT be used toward our SPRING clinic. 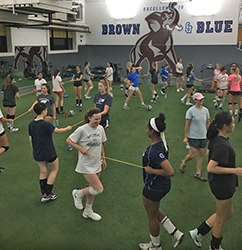 This SPRING clinic is a fundraiser in which 100% of proceeds go to the Tufts University Volleyball program. We are aware of spring breaks, club practices and or class trips that may come up during this 6-week stretch. We have made every effort to avoid these dates, but know that we cannot accommodate every participant’s schedule. Taking these potential conflicts into consideration, we feel that we have created an already discounted price structure for this clinic. No credit adjustments or refunds will be issued for any of the six sessions missed. Thank you for understanding. In addition, due to the popularity and high demand of this clinic as well as the limited number of spots available, NO REFUNDS will be issued once a participant has registered. Please note: SUMMER camp credits CANNOT be used toward our SPRING clinic and discount codes do not apply to SPRING clinics. We try our very best to be helpful and accommodating to all circumstances while also being fair with our pricing due to the demand. Thank you for your understanding with our cancellation, refund and credit policies. If you have any questions at all, please feel free to contact us at anytime as we are happy to work with you.